Hillary Clinton and Tony Blair, the former prime minister of Britain, enjoyed a close personal relationship that allowed them to collude on a number of foreign policy issues behind the scenes. Blair went from helping the former secretary of state make moves in the Middle East to joining former Clinton insiders at a well-connected consulting firm whose work has stoked concerns that the Clintons help their friends profit off their personal ties. Additional details about Blair’s relationship with Clinton have emerged in several batches of private emails that have been released by the State Department at the end of each month, including those published Wednesday. Clinton’s foreign policy partnership with Blair seems all the more unusual given Blair’s past support of President George W. Bush and the invasion of Iraq, a war Clinton voted for in the Senate but has since criticized. Many of the conversations between Blair and Clinton are classified. But unredacted emails paint a picture of a mutually beneficial relationship between the two former leaders. 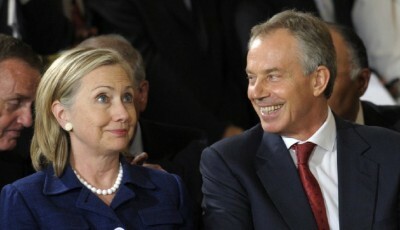 “It’s great having you on the team,” Clinton wrote to Blair in September 2010. Clinton evidently asked Blair to “go to Israel as part of our full court press on keeping the Middle East negotiations going,” according to an email between the former secretary of state and Lynn Forester de Rothschild, a top Democratic donor. At the time, Blair served as the special envoy to the “Middle East Quartet,” a diplomatic arrangement involving the U.S., the United Nations, the European Union and Russia that was established to assist in Israeli peace talks. Blair was also heavily involved in Clinton’s work on Libya in 2011, as the country faced an escalating civil war aimed at deposing its authoritarian regime. Jake Sullivan, Clinton’s former director of policy planning, flagged an article of concern to Clinton in Sept. 2011 that alleged, among other things, that Blair had met secretly with Moammar Gadhafi, ousted Libyan dictator. The Israeli article reported Blair had nurtured a friendship with the authoritarian leader, even flying on Gadhafi’s private jet. Earlier emails indicate Blair and Gadhafi did indeed speak directly when the Libyan leader still held power. In Feb. 2011, a Blair aide sent Sullivan a memo marked “URGENT- PRIVATE AND CONFIDENTIAL” that described a phone call between Blair and Gaddafi. Blair also urged the dictator to find a “safe place” to hide amid rising tensions within the North African nation. Emails released in previous batches indicate Clinton was encouraged to lobby foreign leaders for Blair when he was angling to be the president of the European Council. Sidney Blumenthal, Clinton’s divisive confidante and informal advisor, sent Clinton updates about Blair’s chances in the high-profile race in 2009. Blair ultimately did not secure the position. Clinton forwarded one Blumenthal memo to Doug Band, an aide to her husband, and asked whether Bill Clinton had any ideas to help Blair. Blair also reportedly asked Clinton to lobby Angela Merkel, chancellor of Germany, on his behalf in the fall of 2009. Cherie Blair, the former prime minister’s wife, apparently knew Clinton’s private email address and spoke to her directly while she served as secretary of state. “As you know I have good links to the Qataris,” Cherie Blair wrote to Clinton. Tony Blair joined forces with Band and others in the Clintons’ inner circle to form Teneo Strategies in 2011, a consulting firm whose close ties to the former first couple have drawn scrutiny since its inception. Most recently, Teneo has made headlines for employing Huma Abedin, Hillary Clinton’s former deputy chief of staff, while she also worked for the State Department and the Clinton Foundation. Bill Clinton was even on Teneo’s payroll during its first months. The firm managed to benefit from its close ties to State Department leadership, securing a consulting contract with the agency in June 2011. The State Department severed its ties with Teneo eight months later, after MF Global, a client of the firm, collapsed and took millions of dollars in investors’ funds with it. The close friendship between Hillary Clinton and Tony Blair is one of several relationships exposed in greater detail by the Clinton emails. For her part, Hillary Clinton has embraced the steady drip of published emails as a way for people to catch a behind-the-scenes glimpse of the State Department’s inner workings.